As a replacement to the now defunct SimplifyMedia, I have been using, and highly recommend audiogalaxy to stream any mp3 or .m4a (DRM free) to my smart phone. This app can run on the iPhone/ iPad/iPodTouch or any Android device. The server application (running on the computer with your music files) can be installed on any Windows or Mac OS X 10.5 or greater machine. Here’s a quick run down for comparison. That’s it! Overall, I find audiogalaxy to be the best software that streams your home music library to your smart phone. I would love to see Last.fm scrobbling support too. Genius mixes would be nice too. I just wanted to post a quick follow up as there seems to be some confusion. 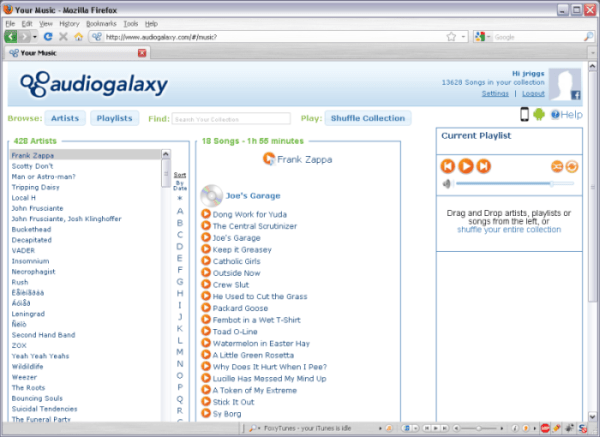 The ‘helper application’ runs on the computer that has all of your music files on it – that’s what serves the mp3s to your phone or browser . As far as monetization, I would imaging that once this app is polished (it is already quite good) the developer will start charging for it. In short, I dont believe that there is any malware of any sort on this app. I have been waiting for a replacement to simplify media, and this looks like it could be it. I unsuccessfully tried a couple of other services, including Orb, which was terribly unstable. Audiogalaxy is a fantastic app. But Iagree with sount ‘ comment, this will not replace my WIFI2HIFI app http://www.wifi2hifi.com/ as my preferred music choice. WIFI2HIFI does not even come close to sharing the same feature set as Audiogalaxy Mobile. You love music? Then you should check out the new iphone music stream application called “YouTune”. It works like spotify or other streaming apps. But the differenc is that my application is not so expensive. I am sure that you cant belive it, when you see the price but, it is true 1,99$ app price and you can stream millions of songs for a life-long. And there is no monthly fee, only tge app price to pay. with this Low price I would only pay, the server costs and a litte fee for me. Greetings from Florida! I’m bored at work so I decided to check out your blog on my iphone during lunch break. I really like the information you present here and can’t wait to take a look when I get home. I’m amazed at how quick your blog loaded on my cell phone .. I’m not even using WIFI, just 3G .. Anyhow, wonderful site! Have you ever considered about adding a little bit more than just your articles? I mean, what you say is valuable and everything. Nevertheless just imagine if you added some great pictures or video clips to give your posts more, “pop”! Your content is excellent but with images and video clips, this website could certainly be one of the best in its niche. Amazing blog!